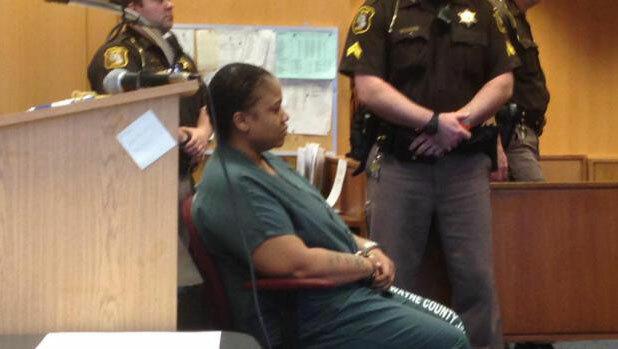 DETROIT -- A Detroit woman accused of killing two of her children and storing the bodies in a freezer says she committed the crimes and wants to plead guilty to murder. Mitchelle Blair made her remarks Friday after a judge found she's mentally competent to stand trial. She says she doesn't need any more time to think about her defense. Saying she's not "a coward," Blair said she would accept the death penalty if it was an option, reports CBS Detroit. "I did what I did for my baby," Blair said, reports the station. "I'm already saying I did it. I'm freely giving myself and accepting life in prison." The 36-year-old Blair is charged with murder, torture and child abuse. The bodies of a 13-year-old daughter and 9-year-old son were discovered in Blair's home freezer during an eviction in March. Both had blunt trauma injuries, reports the station. Her two surviving children have been placed with relatives. Judge Kenneth King told Blair that her case next week goes to Wayne County Circuit Court, like any other felony. He says, "We want this to be done carefully." King reportedly told Blair to take another week and it think over, given the seriousness of the charges. "I'm not going to change my mind," Blair said. "I don't need the week to think about it." Blair has made incriminating statements at other court hearings and has been removed from court after outbursts. At a hearing this month, she reportedly yelled, "Yes, I did kill her,"referring to her daughter.